The Raytheon 8FQ7/8CG7 Medium-Mu Twin Triode is used for direct-coupled cathode-drive RF amplifier in television VHF tuner applications. 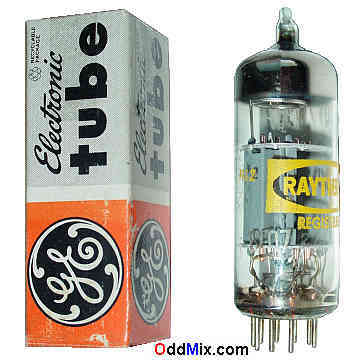 The triodes also works well for AM/FM and general purpose oscillator circuits and for push-pull cathode-drive RF amplifiers.Excellent for antique radio or television restoration projects, circuit reseach, experimentation, audio amplifiers, for a single tube regulated, adjustable laboratory power supply or to set up a private vacuum tube museum. It is a NOS tube - New Old Stock, unused, boxed condition.